After becoming a sub-brand of Xiaomi and a rather grand launch of its most affordable 48MP phone, the Redmi Note 7 is all set to be launched in India. 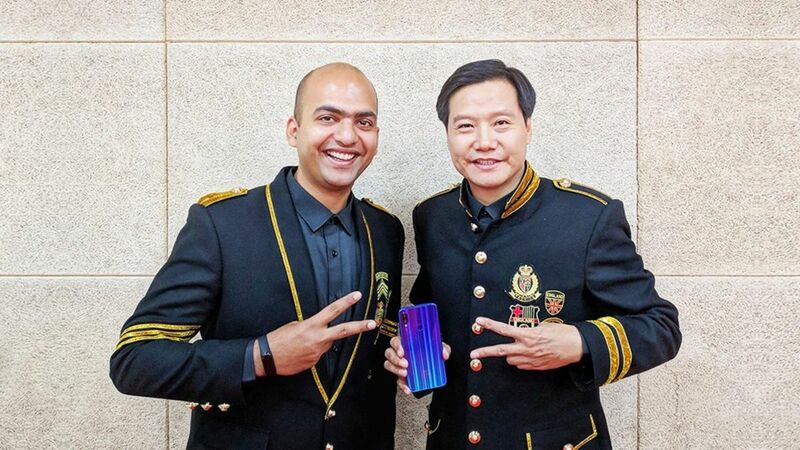 The twitter handle of Redmi India tweeted out a upside-down picture of Xiaomi CEO Lei Jun with Global VP and MD Xiaomi India, Manu Kumar Jain. The phone in Jun’s hand is the recently launched Redmi Note 7. Clearly, the folks over at Xiaomi India are riding the waves of the ongoing underground hip-hop scene in the country. Having said that, the launch of the Redmi Note 7 in India is very much awaited as the phone is already selling like hot cakes in China. To recap, the Redmi Note 7 features a 6.3-inch full HD (2340 x 1080 pixels) IPS display with a tiny notch which gives it an aspect ratio of 19.5:9. The screen is covered by a layer of Gorilla Glass 5 for protection against regular wear and tear. It is powered by Qualcomm Snapdragon 660 chipset with an octa-core CPU backed by Adreno 512 GPU. The 48MP camera on the rear is accompanied by a 5MP depth sensor with dual-LED flash in tow. The 48MP 1/2″ sensor has an aperture of f/1.8 which should optimally be good for photographs. On the front, there’s a 13MP camera for selfies. The back of the phone also houses a fingerprint sensor. Redmi Note 7 has a 4,000 mAh battery onboard which also supports Quick Charge 4 assisting in fast battery charging. In China, the Redmi Note 7 comes with 3GB/4GB/6GB RAM versions with 32/64GB internal storage. The storage can further be increased by up to 256GB via microSD card.